Enjoying fitness that engages your mind and pushes you to relax is a form of workout gaining popularity this year. Finding a yoga studio has become standard in a majority of towns as a tourist attraction. Major cities are even opening meditation studios that open strictly for meditation sessions. Pilates and barre studios are two forms of exercise congruent with yoga that are gaining in reputation across America as a way that “models train”. Brands such as Pure Barre, Booty Barre and more are driving this phenomenon of “seeing you at the barre”. These mind/body/spirit style studios need places with large rooms that are longer than they are wide to allow for the teaching style as well as mirrored walls for the participant to be able to see their positioning during exercise. Cross-fit has become a worldwide workout that has inspired many branches of high-impact fitness gyms to spark across the globe. Besides the cross-fit lifestyle, rock-climbing, ninja warrior, and strength training fitness centers are some of the more popular fitness styles arriving in North Carolina. These studios need wide-open spaces with high ceilings because of the different style gym workouts these athletes do. They might build apparatuses to climb, or need the high ceiling to throw objects. Flipping tires is also a popular workout for these high-impact competitors. If you can’t make it for a bike ride or run outside, new cardio studios are being built for just that purpose. These studios have cycling, rowing, or running classes that burn hundreds of calories in just 45-60 minutes. 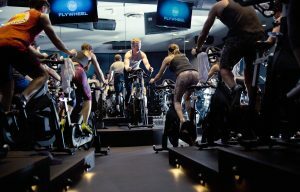 Large brands such as Soul Cycle or Flywheel began the trend in the cycling lifestyle. There is also Mile High Run Club that provides a running coach through your running experience. These cardio studios almost all have a “crazy, fun” atmosphere with black lights, dance music, and lights to go along with the beat. These studios need large spacing for the machines, as well as technology to go along with sound systems, speaker systems, and the machine technology that allows users to track their workout on large screens. If you’re looking for property for your next fitness idea, come to us at Eastern Trust so we can identify the best location in Eastern Carolina for your studio. Check out our current listing and then give us a call today!